"I want to spead the word that if a black "Brixtonian" Rastafarian can make it with just a sauce, then anyone can make it." 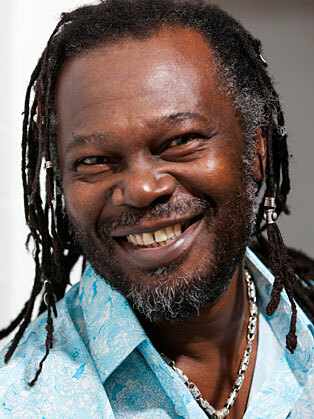 The phenomenal rise of Rastafarian musician Levi Roots is one of the most heart-warming business success stories to date. Levi made the big time from producing his Reggae Reggae Sauce, a delightful mix of barbecue and jerk sauce that won an exclusive contract in 2007 and was soon stocked in Sainsbury’s stores across Britain – Levi’s sauce is the chain’s fastest ever selling product. Prior to that, Levi had been making the sauce from his home kitchen with the help of some of his seven adult children, and selling the sauce at various small outlets in London, including a south London record shop. "I will never forget that little paradise in Jamaica and my saintly Grandmother, who helped to make me the success I am now." Levi’s secret recipe was inspired by his grandmother Miriam Small who taught him how to cook from the age of nine in Clarendon, Jamaica. Levi had the recipe in his head for years but didn’t start producing it until 1991 at the Notting Hill Carnival at what he calls the ‘Rastaraunt’ which is still a regular feature at the Carnival to this day. The rapid popularity of Reggae Reggae Sauce has seen an expansion of the brand, to include a wide range of sauces and products. His first cookery book, Reggae Reggae Cookbook was published by HarperCollins in June 2008 and continues to sell extremely well. His second book, Caribbean Food Made Easy was published in August 2009 and was accompanied by a BBC2 series of the same name. Food For Friends (August 2010), Spice it Up (2011) and Sweet (July 2012) were to follow. Levi has also published a business book entitled You Can Get It If You Really Want, which charts his success and provides tips on how to get ahead in business. Thanks a million for comping back to the British Library and taking part in "Rise With Us". It was one of the best Inspiring Entrepreneur events ever - if not the best!... Feedback from the audience was overwhelmingly positive and I know that they have been hugely inspired by your story and how you became a dragon slayer, in spite of a shaky start in life. It was also great that you gave us a rendition of the Reggae Reggae Sauce song. Levi was a fantastic speaker! He managed to amuse, entertain and most importantly of all, inspire and audience of all ages. Thoroughly engaging.